Today was a great day. The weather was gorgeous, the 3 of us made our first successful trip to the grocery store together, and I was able to cut out an entire new quilt top. This is a postcard quilt using a bunch of fabrics I bought in Hawaii. They’ve been sitting untouched in my stash for almost a year, and I’ve finally found a reason to cut into them. I’ll get into that more later, but for now I’m just excited by how quickly it’s coming together. And really excited that the baby let me cut out the whole thing while happily snoozing in her little chair! She seems to pass out when I sew, which is just awesome. Anyway, I’d bought a pattern called “Postcards” at one of the Hawaiian quilt shops, and it’s just a really straightforward and lovely quilt to showcase these vacation fabrics. A lot of these florals aren’t really my thing, but they seemed like the ultimate when-in-Rome souvenir purchase. 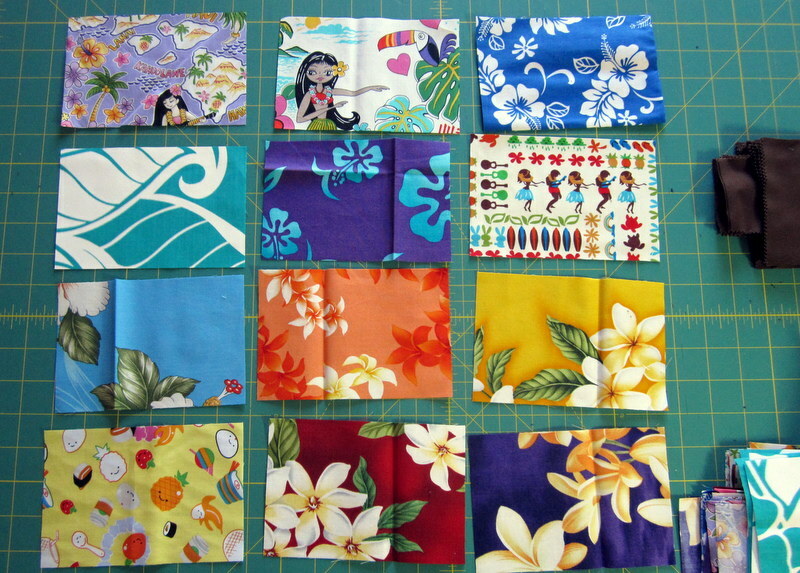 So I cut out 70 4″x6″ rectangles of Hawaiian fabrics. I can’t decide between white and chocolate brown sashing, I’m still working that out. I also have lots of additional fabrics that I may go with, I’m not sold on the above options as the final patterns. But I’m cutting out and playing as I go. I know exactly who this quilt is for, so I’m excited to see it come together!